The ACURADON radon-therapy has proven to be especially effective for the reduction of chronic pain and inflammation processes in the musculoskeletal system. After completing the therapy, many patients can reduce their intake of pain medication for several months and up to a year, simultaneously reducing the negative side effects of pain killers. It can be prescribed for chronic inflammatory and rheumatic diseases, including rheumatoid arthritis and ankylosing spondylitis, as well as chronic pain syndroms and inflammation caused by degenerative conditions such as fibromyalgia, arthrosis and conditions after surgeries, accidents and injuries. How does the radon-therapy work? Radon is an odor-, taste- and colorless noble gas that emanates from the natural decay of radium, a metal contained in the crust of our planet. The concentration of radon in the air varies depending on location as it emanates from cracks and rifts into the atmosphere. The biological effect of radon is caused by the alpha radiation distributed during the decay process. This radiation has – used in low doses and over a limited period of time – a therapeutic effect. Via inhalation, the radon enters the body through the blood stream where it constantly releases its alpha radiation. This low-dose radiation has a pain-reducing and anti-inflammatory effect on the organism. Biochemical processes trigger a stimulus that the organism reacts to and metabolism and immune system are positively affected by. The effect can last up to 6-12 months and can lead to a complete decline in pain. The therapy can be repeated every one to three years for patients with chronic conditions. For which conditions can the radon-therapy be prescribed? Radon Therapy – How do I get my Therapy? Very simple! After the doctor has issued the required prescription, the patients complete the inhalation in 8 to 12 session of one hour each, spread over one to 3 weeks. The inhalation takes place in the spacious therapy room where the patients lie down on individual cots; the odor-, taste- and colorless radon is absorbed via the regular respiration. There are no clothing restrictions and no inhalation apparatuses are used. The therapy room has an average temperature of about 24° Celsius year-round. The radon concentration is constantly monitored and complies with the levels required by the German Spas Association (Deutscher Bäderverband) for a successful therapy. ACURADON, a division of AccuMeda Holding and operator of the radon-therapy, disposes of all the necessary permits under German radiation protection law. Why the radon-therapy in Bad Kreuznach? The radon-therapy takes place as an hour-long inhalation session, with 8 to 12 sessions prescribed. 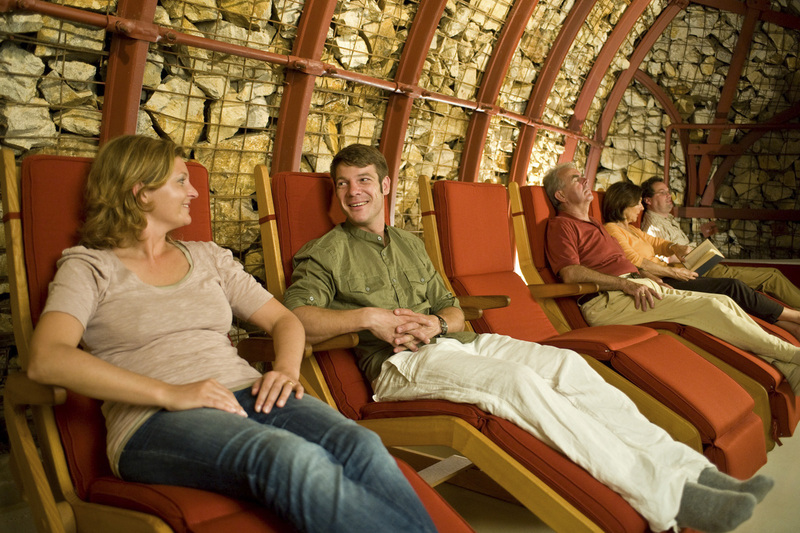 The therapy room has regular room temperature at round 24° Celsius year-round and the air is virtually dust-free. Thus also patients with heart disease and high blood pressure can undergo therapy here. The therapy does not require special preparations or dress regulations: patients do not need to change their clothing beforehand. Thus also patients with specific clothing requirements can participate in the radon therapy without restrictions. The radon tunnel offers ground-level access and is handicap-accessible for crutches, walkers and wheelchairs. Thus also patients with mobility i mpairments can easily profit from the natural pain treatment. The therapy room is spacious and amply lit, creating a soothing and quiet atmosphere for the therapy session. Thus also patients with claustrophobia can also participate in the therapy session. The air in the tunnel is virtually free from dust and allergen-particles. Thus also patients with allergies profit from the enviroment and can take part in the radon inhalation. The efficiency of the therapy is supported by the uncomplicated procedure: no preparations, no getting changed, no exhausting access to the therapy facilities. The therapy sessions consist of 95% therapy time and only a few minutes of preparation beforehand. After the sessions, patients can immediately return to other activities. The inhalation can be completed as an outpatient therapy with patients only coming to the facilities on Bad Kreuznach for their session. The therapy is thus ideally suited for all people that are looking for pain treatment that fits into their daily schedules and leaves time for other activities. Bad Kreuznach has a unique and longstanding experience with the natural radon treatment. It was one of the first therapeutic spas in the world to use radon for medical purposes. For more than 100 years, patients have been profiting from the pain- and inflammation-reducing effect of the radon-therapy, often in combination with the local mineral springs. This so-called “Kreuznacher Verfahren” (Kreuznacher procedure) has garnered fame with spa enthusiasts over the world. In 1911, the local apothecary and chemist Dr. Karl Aschoff discovered that the air in an abandoned mine in the spa district of Bad Kreuznach was rich in radon. In the extensive tunnel system, the noble gas emanates from the cracks and crevices of the volcanic rock. Since 1912, the tunnel system and its radon source have been used for the medical inhalation therapy and since 1974, the therapy sessions are held inside the tunnels that were renovated to accommodate spacious and bright therapy rooms. In 1974, the radon-therapy was taken over by Sanitätsrat Dr. Hans Jöckel who headed this therapy institution with great dedication for over 40 years. In 2014, the radon tunnel was named after him in recognition of his achievements on a national and international scale. In 2014, the AccuMeda Holding took over and ensures the integration of this therapy into the relevant medical competence in the field of rheumatology. Are there any risks connected to this therapy? Radon leaves the body with the respiration. The biological half-life, the time needed until half of the original concentration remains in the body, is only 20 to 30 minutesn so that after a few hours no radon can be traced in the body anymore. During a cycle of 10 one-hour sessions over the course of three weeks approximately 2 milli-Sievert affect the body. This corresponds with the radiation exposure of a 3-week vacation in high mountain regions. Why does radon in residential buildings receive negative attention? Residential buildings with radon sources are – in contrast to the radon-therapy – often contaminated with undetected radiation for many years. Radon itself decays further, causing the decay products to accumulate in dust particles that are in turn inhaled into the body. The ACURADON radon-therapy works with low doses over a limited period of time and the air in the tunnel is virtually free from particles that could cause accumulation. Continuous monitoring guarantees this. For a limited number of indications, radon-therapy is nevertheless prohibited, including thyroid hyperfunction and active tumor diseases. Therefore, a consultation with one of the responsible doctors is necessary to obtain the required prescription. The doctor decides on an individual basis if the therapy makes sense, taking into account the benefits and potential risk factors. For further information on the ACURADON Radon-Therapy, please do not hesitate to contact the ACURADON Team.